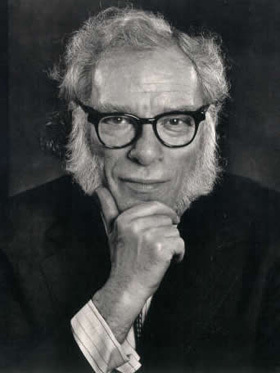 Isaac Asimov (born Isaak Yudovich Ozimov, Russian: Исаак Юдович Озимов; Yiddish: אייזיק יודאָוויטש אסימאוו) was an American author and professor of biochemistry at Boston University, best known for his works of science fiction and for his popular science books. Asimov was one of the most prolific writers of all time, having written or edited more than 500 books and an estimated 90,000 letters and postcards. His works have been published in all ten major categories of the Dewey Decimal System (although his only work in the 100s � which covers philosophy and psychology � was a foreword for The Humanist Way). Asimov is widely considered a master of hard science fiction and, along with Robert A. Heinlein and Arthur C. Clarke, he was considered one of the "Big Three" science fiction writers during his lifetime. Asimov's most famous work is the Foundation Series; his other major series are the Galactic Empire series and the Robot series, both of which he later tied into the same fictional universe as the Foundation Series to create a unified "future history" for his stories much like those pioneered by Robert A. Heinlein and previously produced by Cordwainer Smith and Poul Anderson. He wrote many short stories, among them "Nightfall", which in 1964 was voted by the Science Fiction Writers of America the best short science fiction story of all time. Asimov wrote the Lucky Starr series of juvenile science-fiction novels using the pen name Paul French. Asimov was a long-time member and Vice President of Mensa International, albeit reluctantly; he described some members of that organization as "brain-proud and aggressive about their IQs." He took more joy in being president of the American Humanist Association. The asteroid 5020 Asimov, a crater on the planet Mars, a Brooklyn, New York elementary school, and one Isaac Asimov literary award are named in his honor. When people thought the Earth was flat, they were wrong. When people thought the Earth was spherical they were wrong. But if you think that thinking the Earth is spherical is just as wrong as thinking the Earth is flat, then your view is wronger than both of them put together.